Download the entire report (as a pdf file). The purpose of this report was provide a reasoned basis for estimating future sanitary sewer flows in Brookfield, CT over the next 20-years and to establish, if necessary, an allocation of additional capacity, beyond the current 500,000 gallons per day (GPD) allocation. 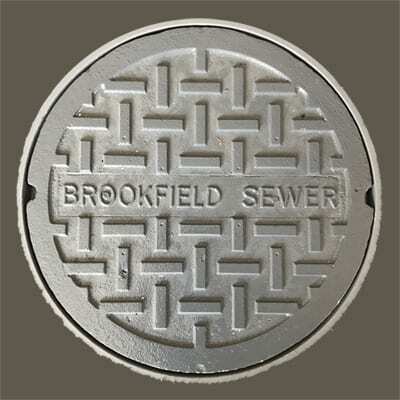 Brookfield only collects sanitary sewer flow for processing at the Danbury, CT regional treatment plant. An understanding of the flows projected over the next 20-years is needed to determine the flow capacity and terms of agreement Brookfield should request or maintain from the regional treatment plant in Danbury. A request for additional flow implies a capital investment contribution to the regional plant. With the information gathered for the 2012 report, the future sewer service areas were estimated. Based on the service area assumptions and the properties included within, the future anticipated sewage flows were calculated. This analysis included an estimate on the number of units included in the existing and future sewer service areas, the anticipated development potential of these parcels based on the Brookfield Plan of Conservation and Development, current zoning requirements, and accounting for environmentally sensitive areas and other development trends in the Town, the projected sewage flows generated by the Town of Brookfield over the next 20-years is projected. 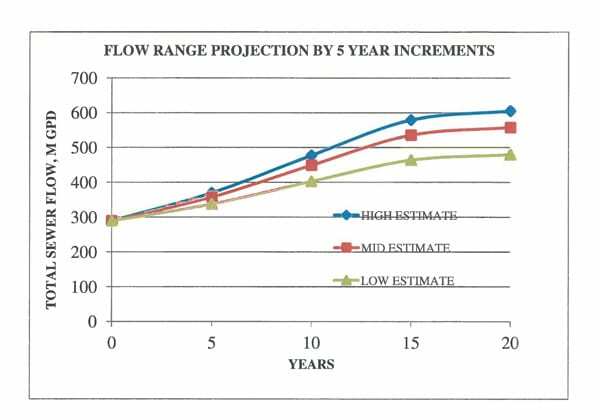 To assist in determining when the current contract should be amended to allocate additional plant capacity, it is useful to estimate flows at 5-year increments for the next 20-years. The calculations for these projections are detailed in the report. Based on this flow projection the Town of Brookfield could generate approximately 600,000 GPD of sewage in 20-years. This exceeds the currently allocated 500,000 GPD. However, it is not necessary to allocate this much capacity immediately. If the most aggressive assumptions are made as to development, that is all projects are completed and all future sewer areas are placed on-line, the average daily flow will ramp up about 600,000 GPD over time. This represents more than doubling of the current flow rate. This does not seem likely. More conservative estimates in the low range show the flows will not come to this level. A conservative flow rate estimate will project the total flow will be about 60% of the maximum possible should all properties come on- line. This rate has the total flow in 20-years rising to 485,000 GPD, just under the current contracted rate. A mid-range rate at 85% of the maximum projects the 20-year rate at 550,000 GPD, about 10% over the contracted rate. Both the High and Mid-range rates do not anticipate the rates will exceed the 500,000 GPD for 10-years. The calculations are summarized in the report. Update 2015: Wastewater flows from Brookfield have been flat for the last 6 years. Growth in Condo and Apartment usage has been offset by a reduction in commercial activity in the Four Corners Town Center District while that area is undergoing change. Download the narrative only (as a pdf file). Note: Report prepared under contract by Birdsall Services Group of White Plains, now Langan Engineering.